The MixPre-10M delivers an impressive combo of functionality and portability that will appeal to both location recordists and studio-based producers. Much of Sound Devices’ gear targets the production sound market; however, change is afoot, with their MixPre range now offering a music-orientated model that ditches the timecode options of their more expensive MixPre-10T. The MixPre-10M uses a single SD card for recording and overdubbing of up to 12 tracks with simultaneous USB 2.0 interfacing to your DAW (12-in, 4-out). Files are recorded as monophonic WAVs at 44.1, 48 or 96kHz, and like other MixPre units, battery powering is an option. You get eight mic/line inputs with Sound Devices’ own low-noise Class-A Kashmir preamps, with two further physical inputs on a stereo 3.5mm jack. Outputs include main L/R on a pair of mini-XLR (TA3) connectors, with headphones and a stereo auxiliary output both on 3.5mm jacks. USB 2.0 interfacing is via a USB-C connector, while a USB-A socket supports a thumb drive or QWERTY keyboard. The MixPre-10M has a handful of physical controls (a multifunction transport joystick, channel knobs and push-button headphone control/data entry wheel) but most of its functionality is via the small LCD touchscreen. Here you’ll find all setup options such as project settings (including sample rate), as well as preamp parameters and recorder/mixer functions. 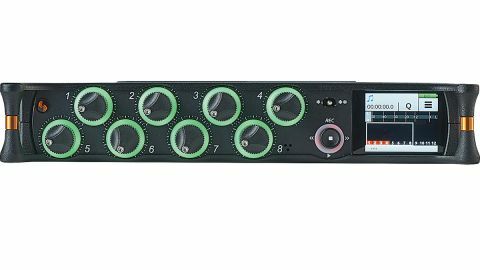 Routing and monitoring is built around the flexible 12-track recorder/mixer, with inputs to each recorder track selected from the eight mic/line inputs, two aux inputs, four USB outputs and L/R mix output. There’s also track-specific input monitoring. It’s one source per track (no grouping), but you can use the L/R input to bounce together existing tracks. The MixPre10-M has many additional features. First up, onboard Reverb (with adjustable Plate, Hall and Room settings) and Air (which adds high frequency enhancement). Both are monitoring effects you could retain by bouncing. The channel knobs include halo-style input level monitoring, offering better feedback than the LCD screen. Further useful features include stereo track-linking, metronome, test tone, cue locators, project history, onboard mic and a front panel momentary switch to access two assignable shortcuts. Sharing options for audio data includes rendering the stereo mix as WAV or AAC, or all tracks as WAV. Files can be transferred via USB-C port to a computer, and projects copied to a USB thumb drive. Reliable, flexible, intuitive and sonically very transparent. The MixPre10-M is reliable, flexible, intuitive and sonically very transparent, and at 20cm square, it shows you don’t need a massive box for premium quality multitrack recording and interfacing. The miniaturisation won’t be to all tastes; a test-run would be advisable.